If you would like to volunteer with us, become a club member. Click HERE for more info. 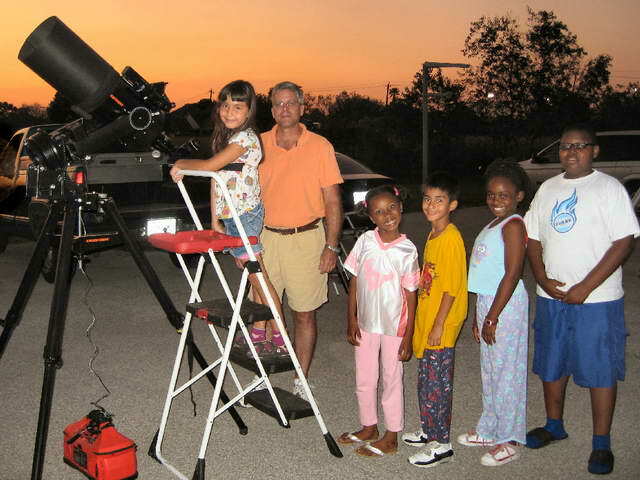 Astronomy On Wheels (AOW) is a club sponsored education community out-reach program that brings astronomy to the public. 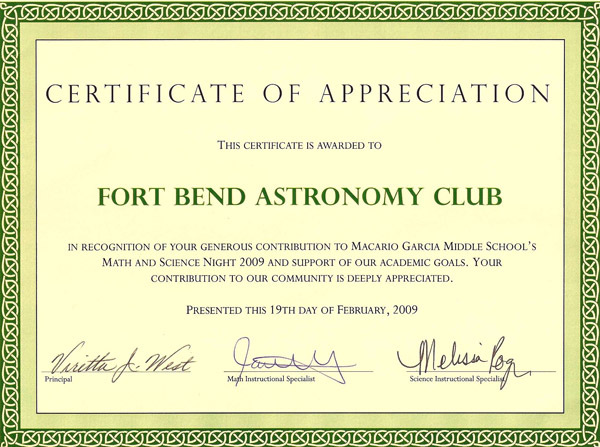 It was also the first astronomy educational out-reach program in the greater Houston area. 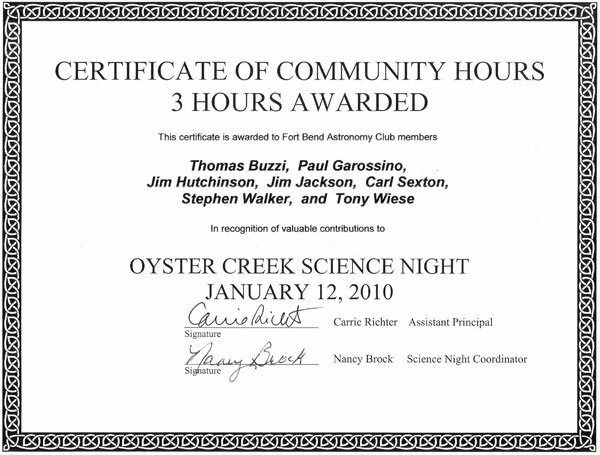 Club members bring their own telescopes or club loaner scopes and conduct star parties for schools, scout groups, as well as an occasional church or homeowners association. Over the years the size of an AOW event has ranged from 50 to well over 1,200 students, teachers, parents and guests. 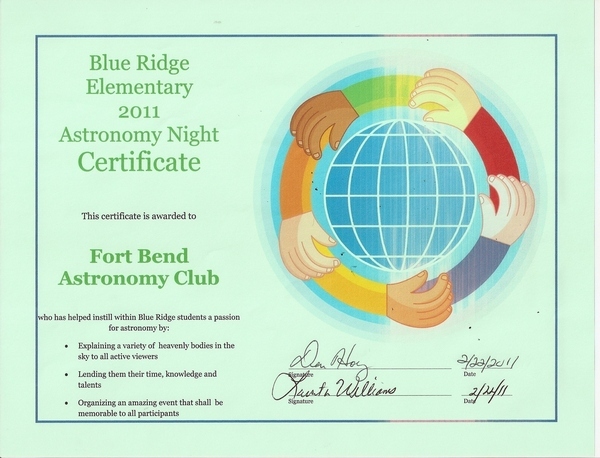 Depending on the event, club members may give a PowerPoint presentation before explaining the science of astronomy. They may also give talks explaining the mechanics of telescopes. The preference is to schedule AOW events either Thursday (1st choice), Tuesday (2nd choice) or Wednesday evenings. 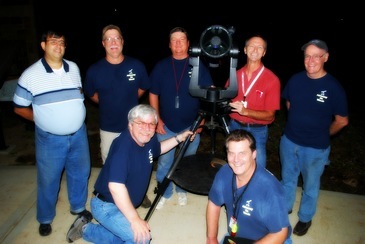 Click HERE to view an article about Astronomy on Wheels in the Fall 2011 issue of Sugar Land Magazine. 14 events with over 3620 students, teachers and guests attending. Astronomy On Wheels hosted 14 AOW events and had over 4,300 students, teachers and guests in attendance. Astronomy On Wheels hosted 18 AOW events and had over 3,900 students, teachers and guests in attendance. 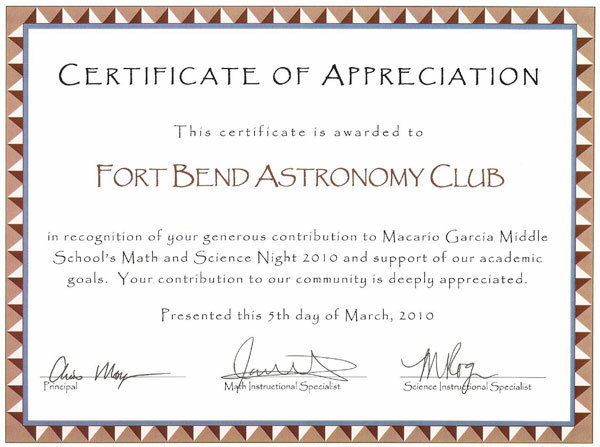 On behalf of the students & faculty of Garcia Middle School, thank you for your participation in our 2010 Math & Science night. Your presence was by far the favorite part of the night with the 1200 attendees. We look forward to your participation for years to come! 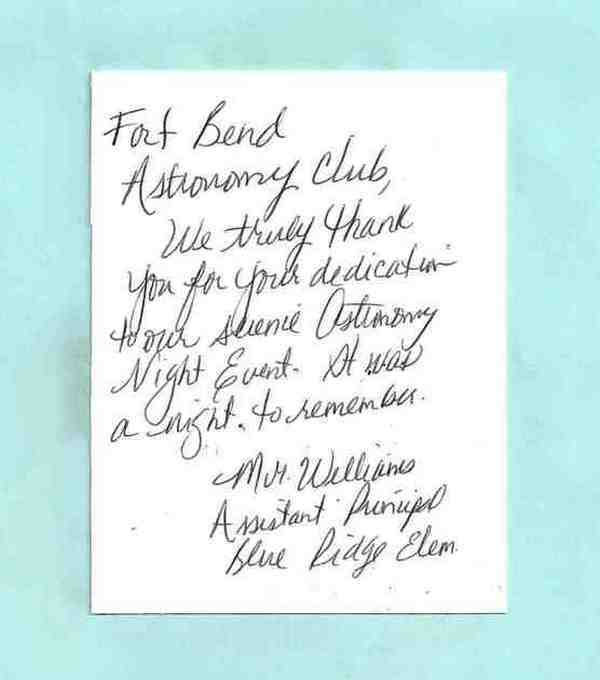 The thanks truthfully go to you all in the Fort Bend Astronomy Club, the kids really had a good time. In fact, there were so many kids from my two math/science classes that had questions about Jupiter I had to halt my planned science lesson and explore Jupiter and some of its primary moons like Io and Europa. We then watched the power point presentation that you all presented in our art class. Needless to say, I have more kids interested in astronomy now than they were at the beginning of the week. Thank you! As the kids would say, you all rock! who attended the Garcia Middle School Math & Science Night. the Galilean moons during an Astronomy On Wheels star party at the school.